I volunteered each Sunday from 12 – 4 p.m. at Pembroke Pines Hospital in South Florida. There were many rules and the expectations for the teen volunteers were high, dauntingly so. We received intensive training that resembled that of a NASA Astronaut. It was the most amazing summer and I came away with a new level of self-confidence. I made new friends and gained work experience to add to my resume. Today, my family volunteers for the non-profit cat rescue organization, Candy’s Cats. It just started off by fostering a cat or two until it was adopted. Now I am a board member and my daughters have learned countless life lessons. The girls, ages 8 and 12, love every aspect of being a volunteer. They do not earn high school hours nor do they earn pocket money from us. Weekends are often spent at the adoption center performing clerical tasks, working with the cats, cleaning, and organizing supplies. They have learned that passion for volunteering must be intrinsic. It’s most important to give of yourself. 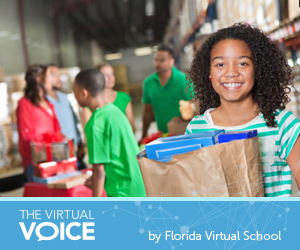 We have also participated in many FLVS volunteering events including Give Kids the World 5k, community food drives, children’s homes repair/drives, and more! FLVS courses such as Leadership Skills Development and Parenting Skills promote the practice of volunteering in the community. From the general insight into the benefits of performing community service to fully developed projects on volunteering, these courses offer our students the opportunity to research and explore all aspects. In the FLVS Parenting Skills course, students learn that they must complete two hours of community service within six weeks. They have a wealth of resources provided to them if they have difficulty identifying an area in which to volunteer. Module 7 highlights youth organizations such as the Boys and Girls Club of America and Students Against Destructive Decisions (SADD). In the lesson, students learn that leadership skills and self-esteem can be developed through active volunteering. In their assignment, students reflect on how they see themselves volunteering and ways that volunteering can positively impact their lives. These responses always move me emotionally. How much could a student learn in just two hours of volunteering? Ever try to eat just one potato chip? While the Parenting Skills course has an expectation of just two service hours, it is our hope that the “potato chip effect” will take hold where they crave more volunteer experiences. When students submit their reflection of their community volunteering experiences, the responses are varied. Some students will complete the course expectation, while others invest themselves in the assignment and come out transformed by the experience. I ask students about the volunteering experiences during the final discussion-based assessment. It is important to respect the opinions of all students during these discussions and I am always asking questions whether the experience was seen as positive or negative. Students may convey that it was something they enjoyed or absolutely hated, but I always ask those probing questions that might be the difference in turning a bad experience into a revelation. With the summer upon us, where will YOU volunteer? Will you give two hours (or more) of your time to your community? Teach by example and volunteer in your community. Not sure where to start? Check out our list of ideas below! Feel free to share in the comment section where you volunteer! This entry was posted in Homeschool Edition, Parent Edition, Student Edition and tagged Animal Shelter, Candy Stripers, Community, Confidence, Leadership, Parental Involvement, Parenting Skills, Service Learning, Volunteering, Volunteers on June 24, 2015 by Dr. Jeanne Giardino.